I have returned from a long hiatus! I was visiting Japan and Singapore for two weeks, and then I was spending this past week putting together this post about Japan. It was an amazing experience, as it was my first time being to an Asian country other than China. There were so many challenges but luckily everything worked out in the end and we had a great time! Be flexible - It was easy to believe we could do so much in a day or walk a few miles with no problem, but it was not easy when we had to keep our backpacks with us. We also took more time at each place than I initially thought we would, so I had to adjust our itinerary accordingly. If we were to visit the Kyoto and Osaka region next time, we would probably pick Kyoto as my base and leave our backpacks in an Airbnb, and travel to other cities and return back to Kyoto each night, rather than carry everything with us to every city. My shoulders and feet endured a lot of pain before we finally settled in Tokyo, so that would have saved us a lot of trouble! Pocket Wi-fi - Getting a Pocket Wi-fi was worth it! It allowed us to utilize Google Maps and Yelp to see landmarks, reviews and photos. I also used the JapanTravel app as a backup for navigating the subways. Since we had the JR Pass, this app prioritized JR routes for us. Use Yelp - Thank goodness there were Yelp business pages in Japan!! I utilized the bookmarks feature to plan our routes and made sure to do Yelp check-ins to remember where we had been. There was no way we could have remembered all the spots we wanted to visit or discovered so many food options. However, many reviews were in Japanese and the business hours were not always correct; I would have helped correct business pages if I had more information. Get the JR Pass - It was worthwhile, especially if since we were traveling to different regions in Japan, which is what we did during this trip. It was also very useful when using the local trains within the cities of Osaka and Tokyo. Use the subway and buses too - While the JR pass was very convenient for the places we wanted to go in Osaka and Tokyo, it wasn’t as useful for every spot we wanted to visit. If there was something we wanted to check out but it was out of the way (in our case, not near a JR Station), we walked to it for the most part. Next time, I would have to make sure it really is worth seeing and do my research before going there. There were some places we could have skipped and other places we went where a bus could have saved us so much time. Do your homework - Learn the end point of the train line you are taking so that you know you are on the right platform. Also, study the stops before and after the station you are leaving from so you know that you can make sure you are going in the right direction. Use a sling/cross-body bag - For guys, it's a man purse, but it will come to be very handy when you have to keep taking out your camera or your passport/JR Pass/transit card. Everyone is nice - Customer service was great and pretty much everyone we encountered was polite and friendly. When the trains arrived, everyone stepped aside to let the passengers out before we boarded the train; there was hardly any pushing or shoving. Even at 7 Eleven, they gave us wet naps and utensils, and we didn’t even have to ask. It was a shame that tipping was not part of the culture there. I could tell the employees gave 110% into their work to make sure the food and service were top notch. Do not expect to see many trash cans - Be sure to keep those plastic bags from 7 Eleven with you! Use passports for discounts - At KFC or Tokyu Hands, for example, there were discounts available if we showed our passports. Splurge on food - Souvenirs can be expensive, but food was worth spending on! Street food was great quality; fast food places gave great service; and higher-end restaurants were worth the splurge since it was a once in a lifetime experience for us. It was such a relief to finally arrive in Tokyo. It was 9:30 p.m. when we got there, but going through customs took about an hour, and we had to also pick up a Pocket Wi-Fi we had previously ordered online. By the time we completed our errands, it was midnight and the public transportation was already closed. Luckily, there were plenty of taxi cabs available to help us get to our Airbnb that was next to Tokyo Station, a 20 minute drive away. We stayed across the street from a 7 Eleven and got some midnight snacks to eat, as well as some food for the next day. We got up bright and early, grabbed a coffee from 7 Eleven, and took a walk toward Tokyo Station. The reason we chose to stay near Tokyo Station the first night was so that we could quickly and easily obtain our JR Passes from the ticket exchange office, which opened at 7:30 a.m. We were able to reserve seats and board the train for Osaka by 8:30 a.m., but not before buying some sushi from the food kiosks at the station! Upon arriving to Osaka, we attempted to go to a sushi restaurant I wanted to try, but because it was a holiday, it was closed. However, we did get to try Okonomiyaki and Takoyaki at Noda Station; we could not find out the English name but it was located at Noda station on the ground floor. We then headed to a department store called Daimaru, which was by Ueno Station, to find Rikuro’s for some awesome cheesecake. The line was short, the turnover was fast, and the cheesecakes were all so fresh and jiggly! We continued our adventure to Osaka Castle. There were a beer festival and other festivities throughout the park, so it was very lively! We walked up to the beautiful castle, took a lot of pictures, and continued past the castle to finish exploring the rest of the park, where we got to see a souvenir shop, ice cream and food vendors, and vending machines with ice cream in it! Our next stop was at Tennoji Park, where our main focus was the downtown area called Shinsekai. This was where we visited Kushikatsu Daruma to try some kushikatsu, which was skewered fried food. So delicious! After that, we were exhausted and began heading toward our next Airbnb to rest for the night. On the way, we walked by Nipponbashi Denden Town, where we saw lots of electronic stores and arcade games with cute plushies. As you will see in the rest of this post, these arcade games were very popular throughout Japan! Day 3 - On to Nara and Kyoto! We took the local train to Nara to see Nara Park and Kasuga Taisha. It was about 5:30 a.m., the streets were dark and no one was on our subway toward Nara. It was so nice and peaceful when we arrived. We enjoyed the quiet streets and the architecture, and admired the deer decor; even the convenience stores carried deer souvenir. The deer were so adorable and friendly, and the temple was beautiful. It was such a refreshing way to start the day! Our next stop was Kyoto, which was a very urban area. This city was where we first tried Curry House Coco Ichibanya. I got the Hand-made "Tonkatsu" Curry at spice level 2, which was pretty low on the spice scale, but it was already spicy for me. After lunch, we had to figure out how to get to Arashiyama. The Kyoto Station was huge, so it took a while to understand how to get to our next destination. 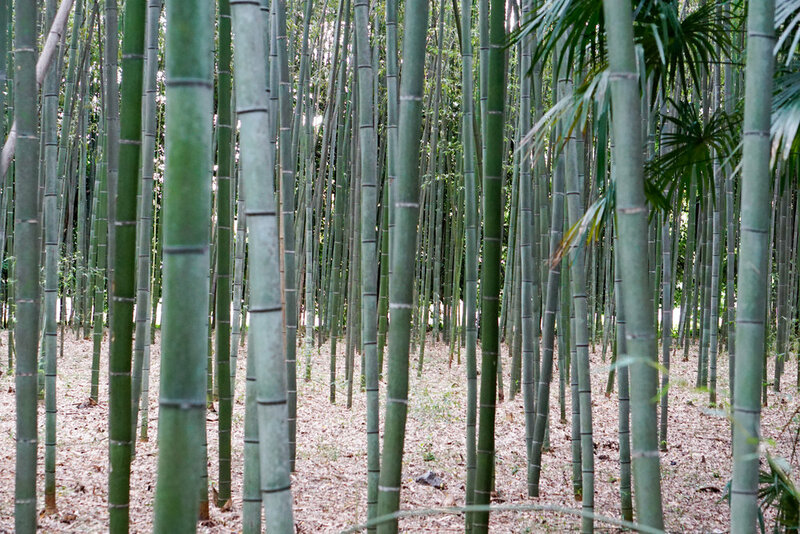 When we arrived, we got to see so much greenery as we headed toward the bamboo forest. I wasn't too impressed with my visit here but it was probably because it was so touristy and crowded, and of course we had been trekking with our heavy backpacks. 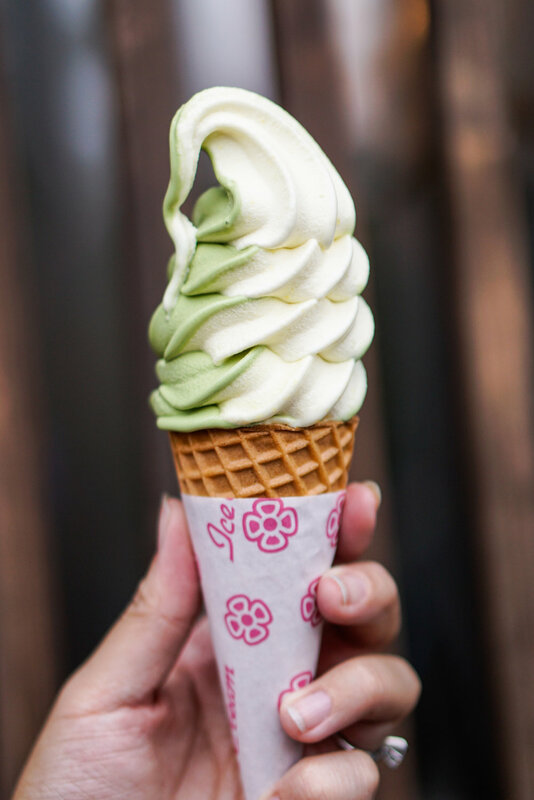 The many vendors selling green tea ice cream made it all worth it though! The next place was very worthwhile: Kinkaku-ji, the golden temple! The temple was gorgeous and at the end of the visit, there were many food vendors that gave us snack and drink samples. The most memorable sample was green tea with gold flakes in it. Awesome! By 4:00 p.m. it was around midnight in the U.S.; it turned out we walked over 40,000 steps within a 24-hour period! We rewarded our long day of walking by eating at Yoshinoya! Unlike the locations in the US, this restaurant carried items like eel boxes and salmon! It was a delicious and fantastic way to end our adventurous day. To end the night, we stopped by a 7 Eleven near our Airbnb, so we got snacks, ice cream bars, and beer! Day 4 - Finishing up our visit at Kyoto and on to Tokyo! We got up early and left our backpacks in the Airbnb to head out to Fushimi Inara Taisha. Leaving our backpacks behind just for those few hours put us in a much better mood than we had been in over the past few days! Our visit to these gorgeous orange gates was so memorable and the views were breathtaking. Like the shops at Nara that focused on the deer, the shops here focused on the foxes. 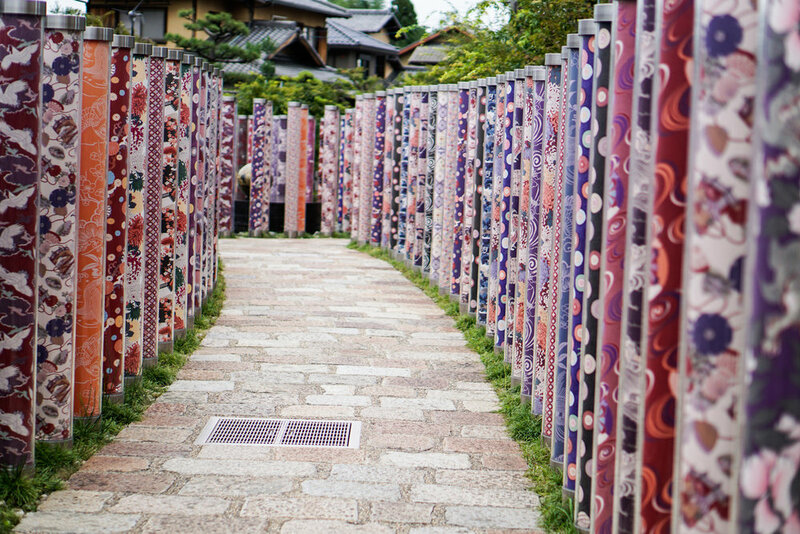 We returned to Kyoto to check out of our Airbnb and finish exploring more of Kyoto. We went to Nishiki Market to visit some shops that sold pastries, dried goods, grilled food, snacks, souvenirs, and candies. I tried the quail egg in an octopus head. It was an interesting snack but I would probably not get it again as it was a cold snack. After all the window shopping, we got hungry and decided to try Ichiran Ramen, a famous restaurant chain in Japan. I got Ramen with Matcha Annin Tofu and it was such an amazing meal. We first ordered at the vending machine and got a ticket. Then we sat at our individual booth and customized the ramen on a piece of paper they gave us, then handed the receipt and paper to the person behind the window. When they handed us our food, they closed the blinds so we could enjoy our meal. Our last spot to check out was the Gion District, where we visited Saryo Tsujiri for their Special Green Tea Parfait. It was expensive but fun to try! We were able to keep walking to check out the Yasaka Shrine, which was a very unique spot! On our way up toward Kiyomizu Dera, we got so exhausted walking through the crowds uphill, so all I could do was to check it out from outside. I believe there was also an admission price to get in to see the temple, but I think we will save that for next time. Our final adventure of the day was to take the train back to Tokyo. It was so lively on a weeknight! Our home for the next few days was near Shibuya Station. After settling down in our Airbnb, we headed to Gyukatsu to wait in line to try some wagyu katsu. It was an hour and a half wait, and the restaurant only seated nine people. I must say that it was definitely worth it! When we finally sat down and got our food, we enjoyed every buttery bite and we also took advantage of the option for a personal sear. Paired with the rice and tororo (grated yam), the wagyu combo was an amazing meal! We ended the evening with some more fun purchases at 7 Eleven, including Lemon Coke, which was not available in the U.S.
Because we lived by Shibuya station, we got to say good morning to Hachiko every morning outside the station (you can see his story here). It was rush hour during our trek to get to Disney Sea; the train dropped us off at Disneyland, so we had to pay an additional fare to take the Disney Resort Line to get to Disney Sea. When we arrived, we saw a beautiful amusement park that was adorned with decorations for Disney Sea’s 15th anniversary as well as for Halloween. The rides and sections were so unique compared to Disneyland. We rode on Toy Story Mania; Indiana Jones Adventure: Temple of the Crystal Skull; Jasmine’s Flying Carpets; 20,000 Leagues Under the Sea; and Venetian gondolas at the Mediterranean Harbor. Mediterranean harbor was where many of the water shows took place, such as Crystal Wishes Journey; Villains World: Wishes and Desires; Fantasmic; and Sky High Wishes. Some restaurants inside Disney Sea had special Halloween menus; we went to Cape Cod Cook-Off for lunch and tried their seasonal pumpkin burger, and found vendors that sold sweets and various flavors of popcorn. We enjoyed our chocolate cookie sandwich, Toy Story alien mochis, and curry popcorn throughout the rest of our day there. The shops also had many Halloween-themed snacks/souvenirs and adorable apparel and merchandise. Our fun day ended with watching the water show, Fantasmic, and the fireworks show, Sky High Wishes! Our day started with the thing everyone must do if they are near Shibuya Station: we went up to Starbucks Tsutaya and watched the Shibuya Scramble. We slept in that day so we arrived to Starbucks at 9:00 a.m.; rush hour was already over, but there was still plenty of foot traffic in that intersection. We got the highly advertised Nectarine Peach Cream Frappuccino with Tea Bavarois. It wasn’t so icy and heavy like the frappuccinos I had been accustomed to in the U.S., but instead, it was fruity, light, and creamy at the same time! We took the local train to Akihabara Station to explore a region known as Electric Town! There were so many electronics shops and arcades here, and it was fun walking around munching on some taiyaki and Pablo mini cheese tarts before our main attraction: the owl cafe. We had made a reservation online to spend some time hanging out with owls. We pet most of the owls and got to hold some too, and the staff took a photo of us with the owls, and gave us a printed copy for us to keep! For lunch, we ate at Ganso Zushi for some awesome conveyor belt sushi, and continued more window shopping (some electronics stores had cute Gudetama and Hello Kitty snacks!). Afterwards, we went toward Ueno Station to walk through Ameya Yokocho, which was a long street of shopping, and to stop by Sensoji Temple. Honestly, these two areas were not too special to us, as some things were very expensive! We settled for getting a bunch of snacks from Don Quijote before moving on to the next area! Our next stop, which was one of my most memorable stops, was at Pokemon Center Mega Tokyo in the Sunshine City building outside Ikebekuro Station. They had cup noodles, plushies, snacks, and so many kinds of Pokemon merchandise here! We also saw a real Ash Ketchum outside the store. After this, we continued exploring the rest of the mall to see more cute stores and arcade games. We ended the night by heading toward Shinjuku Station to eat at Omoide Yokocho, A.K.A. “Piss Alley”, or “Memory Lane”. While it was mainly a spot for locals to eat at, it was a fun experience eating good yakitori among local businessmen chatting about work and drinking beer. One thing we absolutely had to try was Umegaoka inside Mark City, a shopping mall connected to Shibuya Station. They had a vast selection of sushi and lunch sets. We each got a lunch set and were so mesmerized at this amazing sushi! With our bellies full, we did some shopping near the Shibuya and Shinjuku stations at stores such as Tokyu Hands, Loft, and the Disney Store, just to name a few stores I had grown to love during our visit. We also stopped by Tokyo Station for more cuteness at Tokyo Character Street, an area of shopping inside the station that had a lot of merchandise for all kinds of characters. We ended the night going to Odaiba, an island with a beautiful waterfront view. The purpose of this visit was to go to DiverCity Tokyo Plaza, a shopping mall, to see the Hello Kitty Cafe and the Gundam Statue. All the shops were closed or closing soon but I am glad we got to see what we could. We ended the evening in the plaza with some ramen and Baskin Robbins ice cream! I loved the Popping Shower Ice Cream Float I got from Baskin Robbins! Our very last stop was at the Rainbow Bridge, which, unfortunately, was not lit up as a rainbow that night, but it was still very nice to see it in person. We explored Takeshita Street, which was by the Harajuku Station. This entire region was full of cute things, including gift shops, a cafe that served coffee with 3-D latte art, the Line Store (if you use the Line app, it is a store based on the characters in it), Kiddy Land (yes, I was such a kid around everything there! ), and more shopping malls. We also made a stop to Dominique Ansel Bakery, the famous bakery in New York that was home to the original cronut. We returned back to Shibuya Station to send off a few postcards and to continue window-shopping (yes, those were Sweet Potato and Wasabi Kit Kats in the second picture!). I was glad we also made it in time for our dinner reservation to eat some yakiniku at Hai No Daidokoro. Yakiniku is similar to Korean BBQ, which we love eating in the U.S.! It was such a satisfying meal and the meat cuts were top quality! We ended our trip with some actual shopping; we got mainly candies as souvenirs for our family and friends at home. Day 9 - Off to Singapore! By this day, our JR Pass had already expired so we were able to get some assistance from the staff at the subway station to help get us to the airport. During our whole trip, I had been looking for the giant grape Pocky sticks but with no luck. When I did finally find it, it was at the airport. I also saw some Sake flavored Kit Kat bars. The prices were double at the airport, it seemed. These would be nice gifts if I can find them at regular price! Maybe next time. We had our final meal in Japan eating some Cheese Keema Curry and looking out the window to watch the rain. Fortunately for us, we did not encounter rain during our trip! Thanks for making it all the way to the bottom of the post! My next post will be about Singapore! Stay tuned.